On Wednesday, we invited the youth over to our house for a movie night. I love to have some type of treat for everyone, but being on my 'no-spend' budget, I didn't really want to sway. 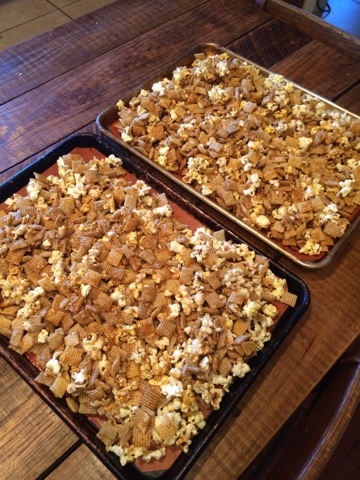 I looked around and found that I had plenty of ingredients for a caramel corn recipe I make. It's been quite a few years since I've made any, so it was a treat for sure. Mix the popcorn and cereal in a large bowl. Melt butter, add brown sugar and corn syrup. Once melted allow syrup to come up to a boil. Cook without stirring for 5 minutes. Take syrup off heat and add vanilla and baking soda. This will make the syrup puff up. See the top pic. 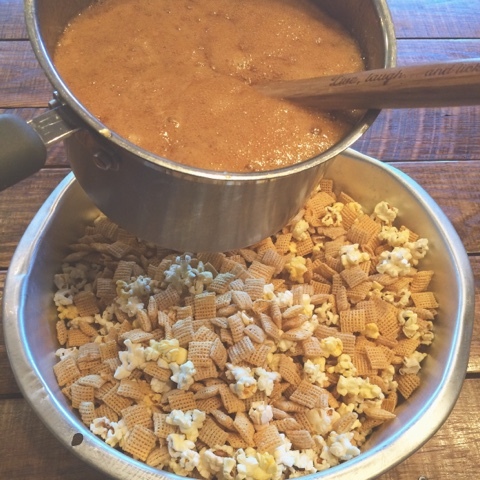 Stir quickly and then pour all over your cereal and popcorn mixture. Pour out onto a baking sheet. Bake at 300* for about 15 minutes.